Today was the inaugural “CicLAvía” event, in which the city shut 7 ½ miles of streets to automobile traffic from 10:00 AM till 3:00 PM so that cyclists and other non-motorized road users could take over the roads. People really turned out for this – I was surprised at the density of traffic. The usually car-clogged streets had an unusually civil feel. It didn’t look like Europe, but the fact that it seemed civil brought Europe to mind anyway. The eastern terminus was Hollenbeck Park in Boyle Heights, which is to say, we had a splendid excuse to go on a long bike ride to Boyle Heights and eat tacos. Carmen and I headed a few blocks past Hollenbeck to Sam’s Tacos on Soto near Whittier. Sam’s is evidently a near relation of Carnitas Michoacan #3 nearby. If you study the image closely, you will see that they share not only the horizontal-hearts banded graphic motif, lending the entire complex a subdued dynamism, but the supersized cheeseburger-fries-and-a-drink thing on the roof as well. Sam’s Tacos is smaller and emphasizes hot dogs. Note the hot-dogged mansard. 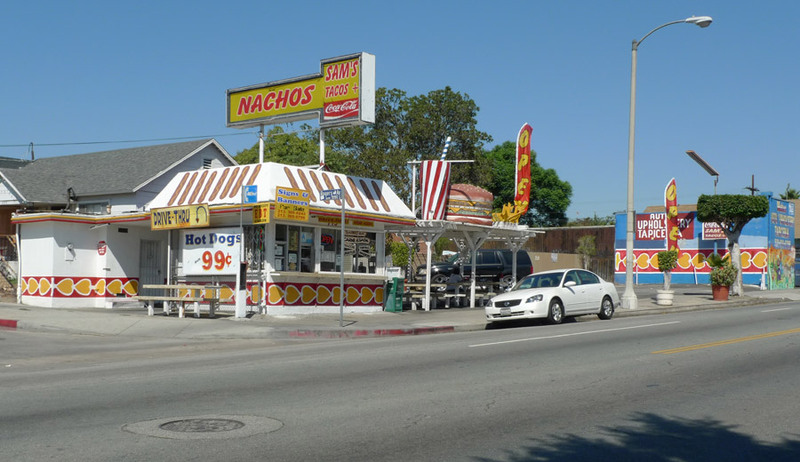 Sam’s Tacos is a bit like Mies van der Rohe’s Barcelona Pavilion, a flexibly enclosed indoor-outdoor-hybrid space defined by a floating-roof plane and ground plane rather than enclosing walls. The main roof, cantilevered in all directions, spans a drive-thru pass-through with a smaller service or storage room across. To the north, a trellis extends the roofline over an outdoor dining area, and supports a giant cheeseburger-fries-and-a-drink sculpture. The dining trellis frames a view across a reflecting pool of black asphalt toward a contrapposto lamppost-signpost. The marble tables beneath the trellis make for an elegant, cool surface on which to dine. I ordered one each of the al pastor and carne asada tacos, cheap at $1.09 each. Not surprisingly, the tacos were unsurprising and hewed close to the platonic taco standard. The tortillas were bilaminated, nicely leathered with a slight oiling and grilling. The al pastor was orange and black, in pleasingly irregular strips – somewhat saucy, with a good toothy texture and cinnamon and other spice flavors prominent. The red salsa provided with both tacos is pretty hot and really good. 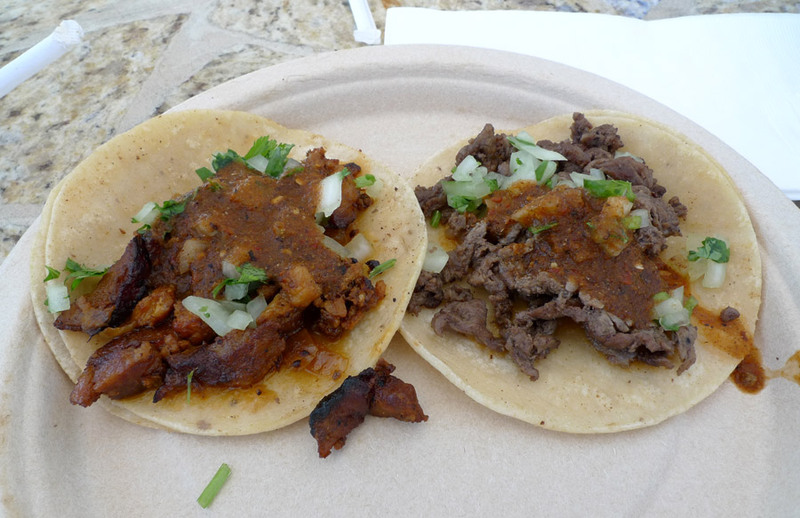 The carne asada is somewhat grayish in appearance but tastes exactly like carne asada taco. The seasoning is spare and the beef flavor somewhat buttery. The quintet of tortilla, steak, salsa, onion and cilantro weave together a timeless and essential harmony. Sam’s Tacos is 100% a taco stand.